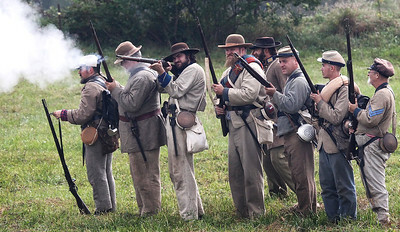 Candace H. Johnson-For Shaw Media Confederate soldiers from the 154th Regiment, Tennessee Infantry fire off their weapons against the Union in a skirmish during Hainesville’s Civil War Encampment & Battle at the Northbrook Sports Club in Hainesville. 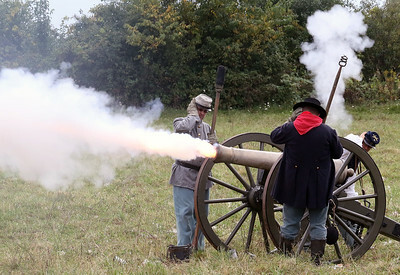 Candace H. Johnson-For Shaw Media Soldiers from the Chicago Light Artillery shoot off a cannon during Hainesville’s Civil War Encampment & Battle at the Northbrook Sports Club in Hainesville. 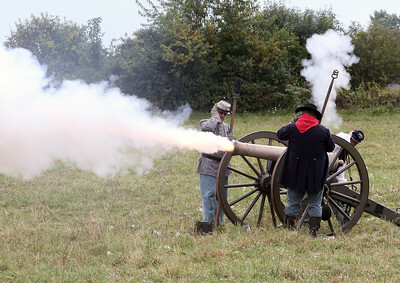 Candace H. Johnson - For Shaw Media Soldiers from the Chicago Light Artillery shoot off a cannon during Hainesville’s Civil War Encampment & Battle at the Northbrook Sports Club in Hainesville. 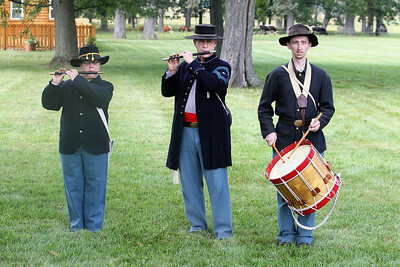 Candace H. Johnson-For Shaw Media Laura Roegner, of Lombard, Dr. Steve Smunt, of St. Charles, and Kevin Skalak, of Westchester, as 1st Illinois Battalion field musicians perform a Fife & Drum concert during Hainesville’s Civil War Encampment & Battle at the Northbrook Sports Club in Hainesville. 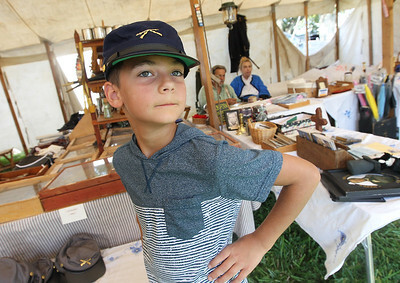 Candace H. Johnson-For Shaw Media Sava Vatistas, 9, of Round Lake Beach tries on a Union soldier kepi hat during Hainesville’s Civil War Encampment & Battle at the Northbrook Sports Club in Hainesville. The hat was for sale in Allen's Laurel Hill Sutlery. 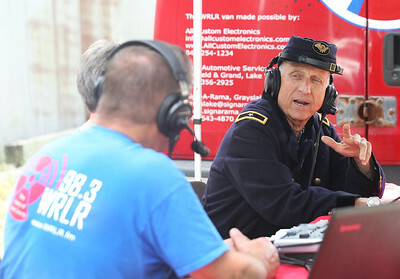 Candace H. Johnson-For Shaw Media Bish Krywko and Adam Huen, with 98.3 WRLR-FM Round Lake Radio, interview George Duberstein, of Hainesville as a Brigadier General during Hainesville’s Civil War Encampment & Battle at the Northbrook Sports Club in Hainesville.Duberstein is a Hainesville trustee and the event chairman. Candace H. Johnson-For Shaw Media Wayne Issleb, of Trevor, Wis., as General Ulysses S. Grant answers questions about fighting the Confederates during Hainesville’s Civil War Encampment & Battle at the Northbrook Sports Club in Hainesville. 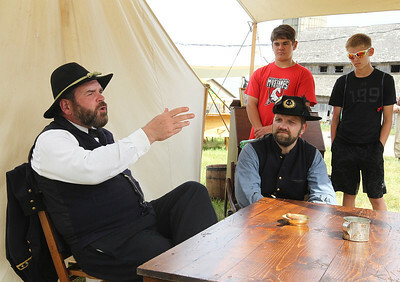 Chris Holzman, of Fond du Lac, Wis., as the captain of the 36th Wisconsin infantry, Lucas Nyberg and Jacob Perraud, both 15, of Mundelein listened to the general. 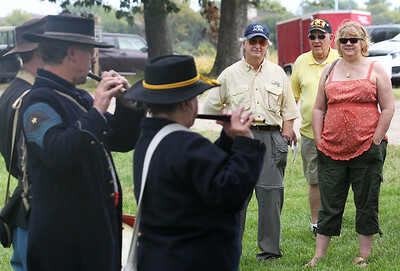 Candace H. Johnson-For Shaw Media Jim Nelson, of Lake Villa, Ken Parrish, of Hainesville and Donna Warner, of Lake Villa listen to a Fife & Drum concert during Hainesville’s Civil War Encampment & Battle at the Northbrook Sports Club in Hainesville. Candace H. Johnson-For Shaw Media Laurel Denny, of Grayslake listens to Sarah Zeien, of Trevor, Wis., talk about a drop spindle as she portrays civilian life during Hainesville’s Civil War Encampment & Battle at the Northbrook Sports Club in Hainesville. 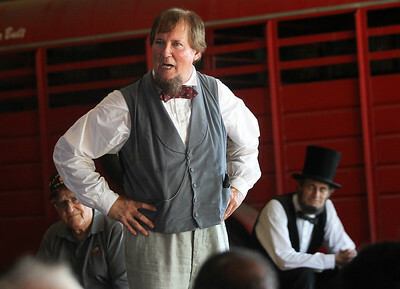 Candace H. Johnson-For Shaw Media David Walker, as Jefferson Davis states his opinion as he debates Kevin Wood, as President Abraham Lincoln in the Lincoln-Davis Debate-Two Views presentation during Hainesville’s Civil War Encampment & Battle at the Northbrook Sports Club in Hainesville. 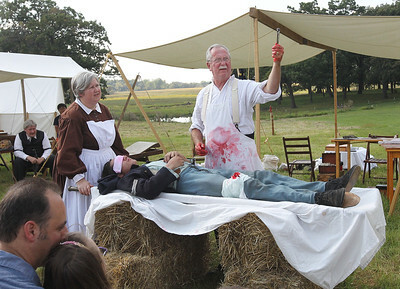 Candace H. Johnson-For Shaw Media Bill Wetzbarger, of Rockford, as a Civil War surgeon, demonstrates surgery on a soldier who had a bullet wound in the 17th Corps Field Hospital during Hainesville’s Civil War Encampment & Battle at the Northbrook Sports Club in Hainesville. 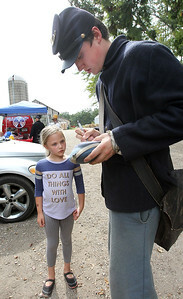 Candace H. Johnson-For Shaw Media Brianna Boles, 5, of Kenosha, Wis., gets an autograph from Jordan Brendemuehl, 16, of Milwaukee, Wis., as a Union soldier with the 45th Illinois Infantry during Hainesville’s Civil War Encampment & Battle at the Northbrook Sports Club in Hainesville. 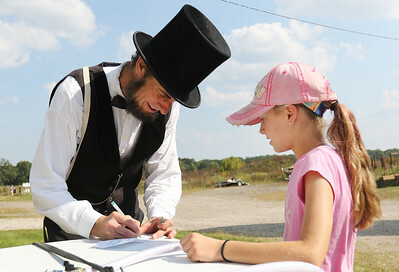 Candace H. Johnson-For Shaw Media Kevin Wood, of Oak Park, as President Abraham Lincoln signs his autograph for Sophia Strine, 10, of Round Lake during Hainesville's Civil War Encampment & Battle at the Northbrook Sports Club in Hainesville. 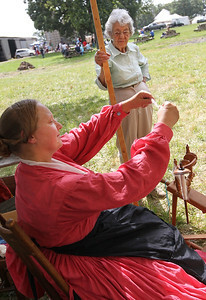 Laurel Denny, of Grayslake listens to Sarah Zeien, of Trevor, Wis., talk about a drop spindle as she portrays civilian life during Hainesville’s Civil War Encampment & Battle at the Northbrook Sports Club in Hainesville.